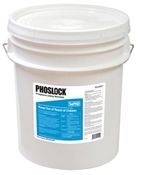 Phoslock is a patented phosphorus locking granule to restore water quality in ponds, lakes and reservoirs. Phoslock was developed by the Australian national science agency, Commonwealth Scientific and Industrial Research Organization (CSIRO), to remove phosphorus from water bodies and restore water quality. Phoslock, Phosphorus Locking Granules is emerging as the best new technology for reducing phosphorus in ponds, lakes and reservoirs. 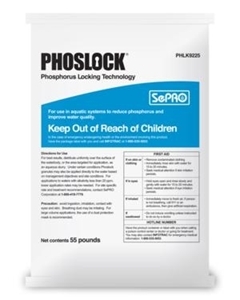 Phoslock is a patented phosphorus locking technology to restore water quality in ponds, lakes and reservoirs. Phoslock was developed by the Australian national science agency, Commonwealth Scientific and Industrial Research Organization (CSIRO), to remove phosphorus from water bodies and restore water quality. For over ten years, Phoslock has been successfully used in water resource restoration programs around the world. Although Phoslock is a new technology to the United States (2010), it is rapidly emerging as the most effective phosphorus inactivation and water quality restoration solution for ponds, lakes and reservoirs. Given the favorable features of Phoslock, such as its very low toxicity, its ability to permanently bind free reactive phosphorus (FRP) over a wide range of water chemistries, and the fact that it does not form flocs, Phoslock is emerging as the most effective phosphorus locking technology for in-situ phosphorus management in surface water. Some products sold by Shoreline and ShorelineAquatic.com carry varrying product use restrictions by federal, state and or locale. Product purchasers are responsible for determining the suitability and legality of the use of our products in their state, locale or for their intended use. The products we distribute may not be registered for use or may be listed as a local or state "RESTRICTED USE PESTICIDE" in your state or locale i.e. NY, WA and CA. It is the purchaser and applicators responsibility to check to be sure a product or specific use is approved in your state or locale before purchase or subsequent product use. Check current product labeling or your local state agency for more information. Most current product labels are available by visiting the product manufacturers websites or at https://www.cdms.net .